For all those who live to surf. 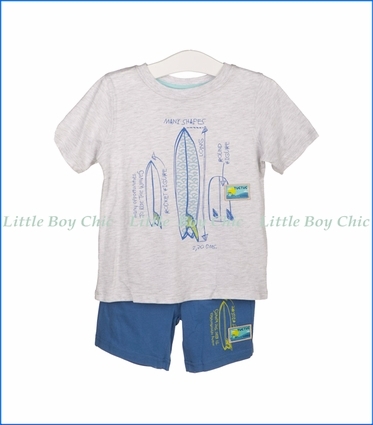 Two-piece set is the perfect surf-ready outfit for the 'grab-and-go' type of kid. Grey jersey tee with surf board print. Bermuda blue coast shorts. Quality cotton is lightweight and soft. Woven label on top and bottom. We chose Tuc Tuc to join our family of LittleBoyChic brands this Spring Season, due to their dedication to creating fresh, fun, and thoughtful garments for children, with design principles that are inspired by the fantasy worlds and the fun that surround children.